Maximum puncture protection for race machines! 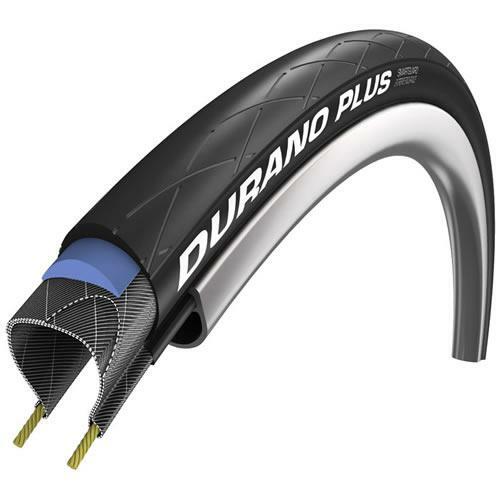 The Durano Plus has a SmartGuard belt for extremely effective protection against penetration punctures. The strong, highly elastic, special rubber layer is not as thick as in the Marathon Plus. Nevertheless it has a level of protection unparalleled in racing cycle tyres. Using a pair of these tyres for 4500km and only had one puncture. Probably can cycle another 1500km. Recommended for touring. Great puncture/scratch resistance and perfect for enduring the winter commute to London everyday. They do what they say they do. Did over 8000km on my rear tyre before replacing it and only got 2 punctures during that period and that was only in the last couple of months. Really great tyres for the winter. Plenty of grip and puncture resistance. OK, they are not the fastest tyres, but for winter miles they are faster than fixing punctures! I switched over to these as my commuting tires when my Vittoria Rubino Pro's suffered fatal slices (to the tires, not me) twice in a month. I didn't want to keep spending money like that so I went with these. What a difference! They're not puncture-proof but they do put up with a lot. Note that these are heavier than usual so you might want to start out with a couple of easy rides with them. I didn't and I actually strained both calves a bit. On the bright side, if you switch over to racing tires you're going to be flying on race day! A great tyre that combines very high puncture protection without excessively compromising performance. I know 5 people who use this tyre and not one has reported a puncture. Been using this for Year, it is not "puncture free", it is not cheap, it is heavier than other tyres, but this "Grandfather tyre gives You very few punctures and many miles. Gold medal for this tyres!